Thousands of Burning Man revellers abandoned their bicycles when they left the desert festival. Will hurricane victims give them a second life and a new purpose? When the rains from Hurricane Harvey finally stopped, everything Yesenia Rodriguez owned was under 20 feet of water. "I lost my bike. I lost my car. I lost all my clothes," she says. "I found my baby picture in a tree." Rodriguez, a real estate agent, went to stay with relatives and is now starting over from scratch. But in a sprawling city like Houston - where pre-storm, 94% of residents owned a motor vehicle - getting to her job and around town without a car was impossible. An estimated 500,000 to 1m cars were destroyed by floodwaters. Many Houstonians don't have the means to replace their submerged vehicles and there's a rental car shortage in multiple Texas cities. So people like Rodriguez will have to convert from four wheels to two. If she had a bike, she says, she wouldn't have to rely on her family to ferry her around in her aunt's car. She could use it to get between bus stops and train stations, to get to work and to go to the shops. But even a few hundred dollars for a bike is currently beyond her reach. "Making any major purchase is out of the question right now." The solution for people in her situation may be coming from an unlikely place, nearly 2,000 miles away in the dry lakebed of the Black Rock Desert in Nevada. After nine days of parties, music and larger-than-life art installations, the 2017 season of Burning Man came to a close on 4 September. In theory, all evidence of "Black Rock City" - which attracted 70,000 attendees to the dusty desert - was supposed to vanish. One of the festival's core tenets is "leave no trace". Logan Mirto, a Burning Man employee, took a picture of the dusty heap and shared it on social media with the caption: "Please ⚡️don't ⚡️leave ⚡️your ⚡️bikes ⚡️at ⚡️Burning ⚡️Man." The picture went viral, fuelled in part by the criticism that Burning Man is increasingly seen as a festival for the elite, attracting millionaires (and a few billionaires) from Silicon Valley and Hollywood. "Throwaway consumerism through and through," one critic wrote on Facebook. "Good job Burning Man goers (those who have the leisure to spend a month in the desert and then leave their crap for others to deal with)." Organisers posted desperate messages on social media imploring anyone with a truck to come and rescue the bicycles, warning they would otherwise be scrapped. Matthew Rockwell, a Burning Man contractor and founder of the charity start-up Disaster Hack, immediately made the connection between the abandoned bikes and the hundreds of thousands of dead cars in Houston. He started picking through the pile and pulled out about 500 bikes he thinks could be salvaged. The photo of the bikes also caught the attention of Meg Kiihne, who lives about four hours from the site. Kiihne once lived and ran a bike shop on Turks and Caicos, and saw pictures all over Facebook of her friends' and family's collapsed homes. She says she knew bicycles could be useful in the recovery effort after Hurricane Irma. "There are parts of the island which will not have power for months," she says. "Bikes can enable somebody who may have lost their home and staying with a friend, they can get to their job at a resort so they can continue to make money to help rebuild their home... they can get around on a bike and get to food." After a hastily arranged Go Fund Me, Kiihne and some friends rented a truck and a storage unit in nearby Reno, Nevada, and headed for the playa. They managed to harvest 110 bicycles. 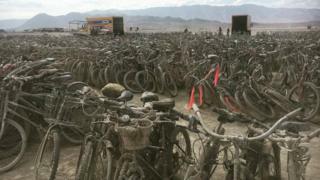 Within 48 hours of Burning Man employees putting out the call, all the bikes had been claimed and "Bike Apocalypse" was over. Now begins the difficult process of cleaning and repairing bikes that spent days baking in the sun and covered in corrosive dust. "We have to go through an intensive cleaning process of cutting off all faux fur, lights, squeaky toys, baskets, and seat covers all trapping clumps of clay," says Kiihne. Once the bikes are cleaned and fixed, the next challenge will be to get them onto trucks and shipping containers heading for Houston and to the Caribbean. Kiihne is continuing to fundraise and negotiating with her industry contacts to try to get her bicycles heading to the Caribbean as soon as possible. While Rockwell says he will keep some in Nevada to lease back to Burners next year, he hopes to have about 100 of them on a flat bed truck and on the roof of his RV heading for Houston in the next 10 days. He says once he determines what the needs are in Houston, he will determine whether to return with another load. Carter Stern, the executive director of Houston's bike share programme, predicts he could easily find owners for all 500 of Rockwell's Burner bicycles. Stern has been collecting donor bicycles for hurricane victims in a campaign called Keep Houston Rolling and says he already has takers for 500 brand new bikes donated from Trek and Giant. "A lot of people who lost a vehicle all the sudden can't get to work, can't afford to get a new car. Long after the TV cameras have left Houston there's going to be a lingering need for transportation options," says Stern. "I think we can give away 1,000-2,000 bikes, no question." Weeks after the storm hit, Stern was able to get Rodriguez a bicycle and she has rented a small studio closer to the heart of the city so that she doesn't need a car - at least not immediately. "I'm able to bike around town now," she tells the BBC. "Slowly, things have progressed, but there's a lot to recover."